From the Clover Bridge, we turned west onto the Onagigawa, and came to the Onagigawa Bashi, which is decorated with plaques, sculptures, and pine trees: all to commemorate one of Japans most respected artists, Hiroshige (1797 to 1858). Hiroshige painted One Hundred Famous Views of Edo (which was what they used to call Tokyo). His ink drawings were carefully put onto wooden blocks which were then carved and made into prints. These prints (in the Ukiyo-e style) revolutionized art not only in Japan but all over the world. Print #97 is called "Five Pines and the Onagi Canal" (小奈木川五本まつ Ongagigawa Gohonmatsu) and it was supposed to be where my photograph was taken (see print below). This is despite the fact that only one pine remained at the time he made the painting and that the Onagi Canal was straight even 150 years ago. Oh well, who said art has anything to do with reality. 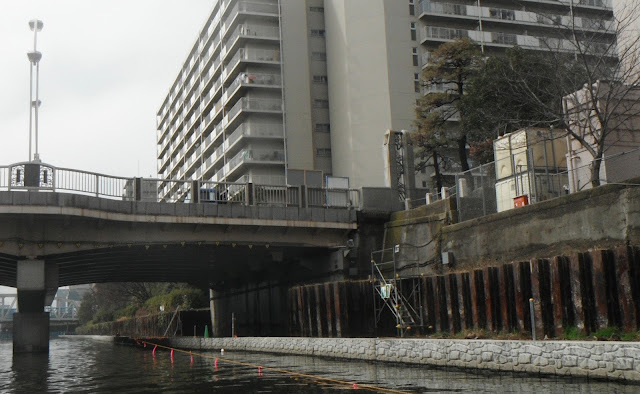 We'll take another look at the Onagigawa Bridge tomorrow. 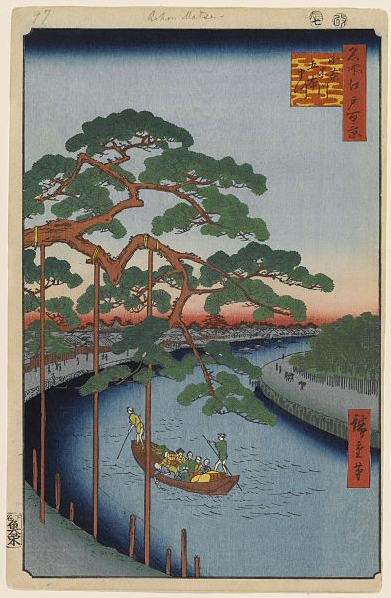 Tokyo, Japan's Bridges: the Onagigawa Bashi, the Artist Hiroshige, and Gohon Matsu (小奈木川五本まつ) by Mark Yashinsky is licensed under a Creative Commons Attribution-NonCommercial-ShareAlike 3.0 United States License.